When using Boss RC Loop Stations, like the Boss RC-3 and RC-30, there are some functionality difficulties that can be addressed with a tap tempo. One of the draw backs of the Boss RC-2 or RC-3 single unit loop station is the need to ‘double tap’ the footswitch to stop the loop. With a Skull Tap attached to the unit a single click of the tap tempo switch will stop the loop playback. Additionally, Boss offers additional controls with a tap tempo device. Beyond the tap tempo control, you can clear the loop or stop the playback. With a dual tap and TRS cable you can use the secondary control to page up and page down the program values with your feet. 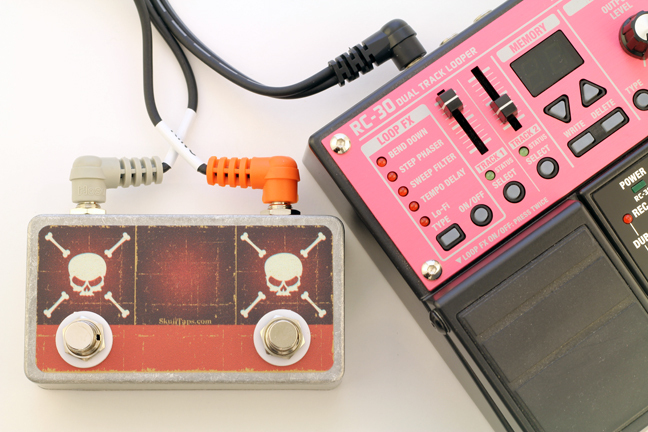 The Boss RC-30 Loop Station can use a dual tap tempo control with a TRS cable to switch tracks, activate the effects portion of the looper or paging through presets. A TRS (Tip Ring Sleeve) cable is required for this functionality. We have dual taps available with a TRS cable or you can purchase a stand alone unit.